Online MPH programs help advanced students in the public health field earn an advanced degree in a flexible learning environment. Many offer a wide range of resources, specialization opportunities and even job placement to facilitate the transition from college to career. The following 50 schools have online MPH programs truly stand out, from affordable tuition and fees to faculty and support services that truly make a difference. See which colleges earned a place on our list of the Best Online MPH Programs for 2016. To learn more about the ranking, please visit our methodology page. 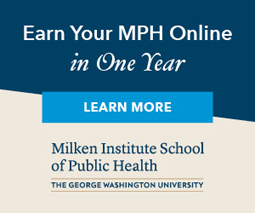 The online Master of Public Health (MPH) program from the Milken Institute School of Public Health at the George Washington University helps students succeed in advancing the health of populations locally and globally. Full-time students earning their MPH are able to complete the program in seven semesters or a little over two years. Prior to the start of their first semester, all students take a 10-14 day course called Strategies and Resources for Online Learning. This zero-credit-hour course is designed to help students learn how online MPH classes work via simulated activities. At the end of their coursework, students must complete a practicum that aligns with their academic goals and career interests. Students are also required to prepare a professional portfolio, make a poster, and give an on-campus presentation. Although most of the coursework is completed online through Blackboard, there are two on-campus sessions required each semester, from a Friday and a Sunday. Therefore over the course of seven semesters, students are expected to visit the campus 14 times. Students wishing to earn an online MPH from UNT need to meet the requirements of both the MPH program and the MPH Professional Option program. To apply to the MPH program students must submit academic transcripts, scores from graduate exams like the GRE, GMAT or MCAT, three letters of recommendation, a statement of purpose and a resume. MPH Professional Option students must additionally have either an advanced degree such as Ph.D or J.D., be currently enrolled in a master's or Ph.D. program or have at least three years' experience working in healthcare. An interview may also be required, either in-person or online. Students also take a practical experience class and a capstone course where they can put their newly-learned skills to use on a real public health issue. Northern Illinois University's Master of Public Health degree program is accredited by the CEPH and available completely online as a distance learning degree. The MPH is offered as two specializations: health promotion or health services management. The first concentration is health promotion. Students will learn about the design, implementation, and evaluation of programs available to people seeking to live a healthier lifestyle. Both social and behavioral sciences are incorporated, and disciplines such as anthropology, psychology, education, and sociology are examined and leveraged in the coursework. This specialization prepares students to take the Certified Health Education Specialist (C.H.E.S.) test, which is administered by the National Commission for Health Education Credentialing, Inc. The second specialization option is health services management. This is also a multidisciplinary pursuit, but it focuses on health-services structures, including the training and managing of health care workers. Candidates can apply online for faster consideration. They will be asked to submit the email addresses of their references, who will then need to upload their letters of recommendation. Apart from the statement of purpose, no additional writing samples are required. Students with an average GPA of 3.0 or above can also separately apply for a graduate assistantship position upon completing the GRE. New Mexico State University-Main Campus offers their accredited Master of Public Health degree completely online. The program is accredited by the Council for Public Health and is aimed at students who are currently working in the field of public health and are not able to attend the physical campus to earn a traditional MPH. The online MPH degree prepares students for work in a variety of health-related fields, and students will have the opportunity to participate in real world service activities that benefit the university and the state of New Mexico. The school also offers a graduate-level public health certificate, which consists of five courses with a total of 15 credit hours. The online MPH program is meant primarily for residents of New Mexico, but is open to all residents of the Southwest. Most MPH courses are restricted to MPH students only. Not all graduate courses will transfer, and any courses taken prior to acceptance into the MPH program have to be petitioned into the program after the applicant is accepted. Students are only accepted for the fall semester, whether they pursue their degree online or at the physical campus. Online applications are due March 15. The University of Iowa's College of Public Health does not just offer one Master of Public Health degree -- it has several MPH degrees in different specialties: community and behavioral health, epidemiology, policy, health communication, occupational and environmental health, and quantitative methods. The school also offers joint MPH degrees in professions like law, medicine and dentistry. Students can take most core MPH courses through distance education, but for many programs, at least half of the course work is done in Iowa City. While all specializations require some on-campus attendance, some -- like the MPH for practicing veterinarians -- minimize travel through accelerated two-week, on-campus institutes. Online core courses are generally asynchronous in format, meaning students can access materials and submit work at their own pace. The University of Iowa's MPH program is designed for both practicing professionals and recent college graduates. Core classes in the five primary disciplines of public health: epidemiology, biostatistics, environmental health, health policy and management, and social and behavioral sciences--are supplemented with a range of content-specific electives. All students are also required to complete a practicum, meaning they must accrue a minimum number of clinical hours in the field before they can graduate. UI's MPH programs vary in specialty, graduation requirements and online accessibility. National University's online Master of Public Health degree teaches both qualitative and quantitative skills needed to work in the field of public health. Students may move on to fields such as health care administration, the promotion of social justice, disease prevention or the promotion of public health. They may work in the non-profit, private or public sectors. The online MPH program encompasses 16 courses or 72 quarter units. A total of 13.5 quarter units may be applied as transfer credits for equivalent graduate work completed at another college or university. Core classes include U.S. healthcare system, biostatistics, epidemiology, theories of health behavior, public health and the environment, public health and research methods, public health internship and public health capstone. In addition to core courses, there are three available specializations: health promotion, healthcare administration, and mental health. Students will learn how to analyze the planning and implementation of health policy, as well as analyze the distribution of diseases and disabilities. All coursework is multidisciplinary, and the faculty who teach the online courses are experts in their areas of study. The MPH program is accredited by the Council on Education in Public Health. San Jose State University's online Master of Public Health degree is a rigorous, practice-oriented program designed with flexibility in mind. According to the program's official website, it also happens to be the only online MPH program in California--and one of only two in the country--accredited by the Council on Education for Public Health. All courses are delivered online, though students must meet once a year in San Jose for a four to five day intensive, depending on the cohort. Courses are accelerated, lasting between five to seven weeks. The format means students can complete the program in as little as 24 months, but students can still manage their course loads and complete courses at their own pace. SJSU's online MPH students will complete a balance of core health education and public health courses and a practicum in the field (through a local health agency). Distance learners are required to log in to one live session for each class each week, but all remaining work and materials are available online to download and view as their schedules allow. Classes are managed via the Blackboard Collaborative learning platform and lectures are delivered using state-of-the-art synchronous web conferencing with two-way audio and multi-point video. Interactive whiteboards, application and desktop sharing, session recording, and virtual breakout rooms further enhance learning. All online students are required to pass a comprehensive exam at the end of the program. Prospective students can contact SJSU to learn more about online MPH program and technical requirements. The Keck School of Medicine at the University of Southern California offers an online Master of Public Health degree program designed to educate emerging and current professionals in the field. USC's online MPH students have access to the same types of practicum opportunities as those reporting to classrooms. Online courses strike a balance between core and specialty public health topics, allowing students to customize their education to meet their goals and levels of experience. Potential areas of emphasis include Biostatistics and Epidemiology, Health Education and Promotion, Global Health Leadership or GeoHealth. Students enrolled in the online MPH program access course assignments and materials through what the university calls a state-of-the-art learning platform. Content is available around the clock and is largely self-paced, though some courses require students to log in to live online sessions or virtual office hours. Students may also coordinate with classmates for occasional group work or study help; interactive tools like online message boards, email and social media encourage personal connections. While offering a flexible schedule, the program was designed to be completed in two years of full-time study or four to five years of part-time study. Online students must meet the same hands-on clinical or practicum requirements as campus-based students, but can do so through local health agencies of their own choosing. The University of West Florida offers a plethora of online degrees, including the Master of Public Health program. The school says its MPH program is intentionally allied with several different academic centers and certificate programs to expand educational opportunities for students in the program. USF's School of Allied Health and Life Sciences offers online learners additional, industry-specific support and networking through the MPH internship coordination program and partnerships with organizations like the Student Association for Public Health. UWF's MPH program is a fully online program requiring no classroom work, though all students must take and pass a comprehensive proctored exam at an approved testing facility. A key component of the online MPH program is the public health internship, which culminates in a written report regarding the intern's research findings. Students take many of the same core, specialty and elective courses as they would on campus, but in a distance learning format. Classes are often self-paced, but students are required to complete a certain number of semester units per year. Online students have opportunities to connect and work with instructors and classmates using interactive web-based tools, and have access to many of the same academic support services as traditional students. The University of Alaska at Anchorage designed its Master of Public Health in Health Practice degree to prepare future leaders to identify, assess, prevent and mitigate community health challenges. This MPH program offers a blended format: all required courses are available through online learning, although students attend one mandatory meeting each year--typically in conjunction with the Alaska Public Health Summit. Candidates for graduation also present an in-person oral defense of their thesis or final project at the end of the program. Students enrolled in UAA's MPH in Health Practice program take courses in the areas of health education and behavioral sciences, occupational health, health management, epidemiology, biostatistics and more. They discuss how to research public health issues effectively, evaluate public health programs, and respond to public health emergencies and disasters. Studies explore subjects such as scientific investigation, community engagement and circumpolar health issues. UAA's hybrid master's program consists of 42 credit hours, and students should complete at least 6 credits each year, preferably 6 credits each semester. Applicants need a GPA of 3.0 as well as a college course in statistics with a grade of C or higher. Other admissions criteria include samples of professional-level writing and a resume. Idaho State University launched a fully online Master of Public Health (MPH) degree in 2014. This degree program is targeted to working professionals in the public health field. The program goals include instruction, research, community service, and continuing education. Applicants interested in enrolling need a bachelor's degree with a minimum 3.0 GPA. Most students need to submit GRE exam scores, except those who already hold a professional doctoral degree such as PharmD or Juris Doctorate. Students must submit two letters of recommendation, along with an essay discussing how an MPH would help the student's career goals. In addition, two years of experience working in the healthcare field is preferred. Students who have obtained a health-related bachelor's degree may use that degree to take the place of work experience. Students at Idaho State take a total of 48 credits of core courses and electives. Core courses include: Leadership and Administration, Environmental & Occupational Health, Health Program Planning and Social & Cultural Perspectives in Public Health. Students must also complete a thesis and an oral exam are also required. They must choose the topic of their master's thesis, in conjunction with their advisor, by the beginning of their third semester. The oral exam, based on the student's thesis work, occurs after a student takes all core courses. Community Health Sciences: 42-51 required credit hours, depending on prior experience. Curriculum includes 6 core courses, 5 required credit hours, elective courses and field experience with a capstone project. Health Policy and Administration: 42 required credit hours, with 23 credit hours of core courses and 19 credit hours of elective courses. Designed for currently employed health professionals or those with graduate degrees in a relevant field. Public Health Informatics: 51 required credit hours, with courses covering the design and use of information systems in the field of health. This program examines health data definitions and standards, management of health information system projects, structure of databases and networks, and operational technologies. All courses in the MPH online degree program are delivered asynchronously, and there are no more than 20 students per class. Through instructional tools such as multimedia and threaded discussions, as well as tech support services, students can earn their master's degree off campus. Certain MPH programs require participation in experiential learning through field work in the community. The curriculum differs for each program, but core courses address topics such as biostatistics, environmental health sciences, epidemiology, social health behavior, and health care organizations and policy. Participants complete 19-20 credit hours in the MPH core curriculum, including integrative experiences, and an internship (minimum 3 credits). Credit requirements vary -- for example, the ENHQ concentration consists of 42 credit hours. MPH degree students are required to demonstrate competency in the biological basis of public health, which can be met in a number of ways: a previously earned professional degree in a field such as medicine or nursing, extensive education in biological/biomedical courses with a minimum grade of B, or a score of 70 or above on the Biological Basis of Public Health Exam administered by the university during orientation week. New students can prepare for this exam with a study guide provided as part of the Blackboard online orientation course. The University of California, Berkeley's innovative on-campus/online professional Master of Public Health degree program allows students to earn their MPH degrees almost entirely through distance learning. The program requires two accelerated on-campus sessions, each lasting one week, while all remaining coursework can be done online. The degree is designed to be completed in seven semesters (even for students working full-time) and includes a balance of core public health courses and broader interdisciplinary courses. Students can gain a deeper understanding of several areas of public health, like biostatistics, epidemiology, health service management and environmental health. UC Berkeley's web-based MPH program requires a minimum of 42 units earned with a grade of B or higher. Many courses are asynchronous, meaning students can access lectures, submit homework and complete quizzes any time, day or night, through the school's Angel Learning Management System. Students can connect and collaborate with instructors and peers through a diversity of social tools like VoiceThreads, Blackboard Collaborate and Piazza. Prospective students can contact UC Berkeley's School of Public Health to learn more about the on-campus/online professional MPH degree program, including admissions criteria and technical requirements for participation in digitally delivered courses. The University of South Florida's College of Public Health offers several specialized Master of Public Health degrees in a hybrid format. Online MPH degrees are available in the areas of public health practice; public health administration; global disaster management and humanitarian relief; epidemiology; infection control; and health, safety and environment. These programs generally blend fully online courses with brief on-campus residencies. For example, the MPH in public health practice integrates online classes, a fieldwork practicum, and a 5-day on-campus visit to participate in the final seminar and take the comprehensive exam. The degree focused on public health administration features an on-campus capstone course in Tampa. In comparison, an Executive MPH program has weekly on-site classes in addition to elective courses taken online. USF's online MPH courses allow students to connect and collaborate with instructors -- and each other -- via interactive tools like web conferencing, wikis and discussion forums, while supplementing their studies with blogs, podcasts and other streaming media. Online MPH students also have access to many of the same services and benefits as those enrolled in traditional, campus-based programs, including academic guidance. Current and prospective students can get a sense for how online learning works by viewing COPH's online tutorials for using the Canvas course management system, the Collaborate web-conferencing program and online library tools. The School of Public and Community Health Sciences at the University of Montana offers a Master of Public Health (MPH) degree program with a core curriculum available through distance learning. Courses for this program can be taken completely online. Classes use the Moodle courseware learning management system, along with Vidyo video conferencing. In addition to online classes, participants also need to complete a practicum to gain experience in the field of public health. The University of Montana's online master's in public health program requires completion of 42 credit hours, 36 core credits, a practicum, professional paper, portfolio, and 6 elective credits. In general, full-time students can complete the program within 2 years (21 credits/year) and part-time students can complete it within 3.5 years (averaging 6 credits/semester). MPH students may be able to transfer a maximum of 6 credits to be used towards elective courses. For individuals interested in the field but not yet ready to enroll in a master's degree program, a certificate in public health is available. The MPH program is offered during spring, summer and fall terms. The application deadline for fall admissions is April 30th, and the deadline for spring admission is September 30th. Applicants are required to submit an online application, which includes a personal statement, CV/resume, proposed plan of study, three letters of recommendations, as official transcripts and exam scores. Loma Linda University offers two Master of Public Health (MPH) degrees online-MPH in Health Education and MPH in Population Medicine. To apply, students need to submit an application, three letters of recommendation, a personal statement, and academic transcripts. Additionally, international students need to prove English competency with the TOEFL exam. MPH students all start in the fall semester. For students interested in earning an MPH in Health Education, the degree program will take one and a half to three years to complete. The curriculum focuses on promoting positive health behaviors by looking at scientific data and learning theories. Students who earn this MPH degree are able to take the Credentialing Examination in Health Education, Certified Health Education Specialist (CHES). Prerequisites for enrollment include college-level writing skills, anatomy or physiology, and two behavioral sciences courses. The MPH in Population Medicine is designed for professionals already employed in public health and have experience in direct patient care. Students pursuing a master’s degree right after an undergraduate degree may not benefit from pursuing this degree, considering it won’t help with big career changes. Professionals who may find this degree useful include social workers, nurses, psychologists and dentists. Nova Southeastern University online Master of Public Health program was designed to prepare current-and future-public health professionals for the rigors of the field, but from the comfort of home. Students are required to attend just two on-campus weekend seminars: one at the beginning of the program and the other at the end. All other courses can be completed online using what NSU calls state-of-the-art distance learning technology. While most students can benefit from the convenience and flexibility of NSU's online MPH option, the program can be particularly helpful those who have career and family obligations to tend to. NSU says its online MPH degree program was designed to meet a growing need for public health officials in a diverse range of settings, including health care facilities, public health departments, and social service agencies. Students will learn how to define, assess, and resolve public health problems on both a local and global scale. They will also learn how to promote health, prevent disease, and develop and evaluate programs, all while mastering the ins and outs of clinical practice, research, and community service. The program was designed to be completed in two years of full-time study, but students can set their own pace. The University of Akron, a comprehensive research and teaching university, offers a non-traditional Master of Public Health (MPH) program with online classes to fit the needs of working professionals who do not have the time or freedom to regularly visit campus. This distance learning degree is available through the Consortium of Eastern Ohio, a partnership between the University of Akron, Cleveland State University, Northeast Ohio Medical University, Ohio University and Youngstown State University. Core courses for this program are offered Saturdays via interactive videoconferencing. Students take electives at the University of Akron, or they can submit a cross-registration form in order to attend any of the other partner institutions. Options for electives include an experiential practicum. Program participants complete a capstone project working with advisors from both the faculty and the community. Candidates for graduation present their final capstone research and a portfolio demonstrating their achievements to a faculty panel. The MPH degree program follows a generalist track rather than specializing and requires 42 semester credit hours. All applications and materials for this program must be sent by January 15th. Candidates provide official transcripts and academic records, three letters of recommendation, GRE scores (and TOEFL scores for international students), a statement of goals and a $45 non-refundable application fee. Earning an online master of public health is an ideal format for students who are unable to leave their full-time jobs. Students can “attend” online classes at their convenience, from home or overseas. Assignments are generally research-based and submitted via email, Blackboard, or a similar method online. Classes are flexible and abundant, with students often having the same wide range of course offerings as they would at a traditional campus-based school. Many programs offer the majority of coursework online. However, students may connect with their peers and professors in short, intensive courses offered in one- to three-week segments for classes that are not suitable for an online format. In an accredited program, online students are held to the same rigorous standards as their brick-and-mortar counterparts. High-level degree programs often begin with an on-campus orientation and other on-campus requirements spread out over the course of the entire program. By necessity, many master of public health programs are hybrid, with about 20 percent of the program completed on campus. Ideal candidates for an online MPH include those who are motivated and are self-starters. WHICH ONLINE MPH PROGRAM SHOULD YOU PURSUE? A master of public health, or MPH, is just one area of focus for those interested in affecting public health and policy. Depending on what your career aspirations are, you might want to pursue a dual degree or specialty. An online MPH, offers a wide range of options for students interested in advanced study in the health field, and some colleges and universities allow students to blend their MPH with a complementary field, such as a master’s in business administration (MBA) or a master’s of science in nursing (MSN), to earn a dual degree. This dual education is a great way for students to focus their public health coursework to an area of personal interest and also allows students to earn both degrees in a shorter timeframe than they would if they pursued each degree independently. Some colleges offer these dual degree options online for even more convenience. Which type of online MPH program meshes with your academic and professional interests? Many colleges, including elite universities, offer an online master of public health. Depending on the school, this program may be offered 100 percent online or in a hybrid format with some in-person requirements, and in a full- or part-time basis. A general master of public health prepares students to become leaders in public health administration and address health issues—locally and globally—using advanced methodologies and the latest research. Many students pursuing an online MPH are already industry professionals with several years of work experience and are looking to transition into leadership roles or a particular specialty field within public health, such as epidemiology for example. An online MPH generally takes two to three years to complete, but some universities offer a fast-track option. A capstone or research project often completes the program, allowing students to focus on their own professional goals and personal interests. Some online programs also require a certain amount of fieldwork hours. An online MPH combined with an MBA allows students to integrate the philosophies, functions, and competencies of public health and business. For example, students look at cost-saving measures within public health and learn about population-based health, finance management, and strategic planning. Many programs are full time and can be completed in about two years. Most coursework can be completed online, but some programs require the completion of an internship. Medical students in their final years of coursework may also pursue a dual-degree in public health. These students take a leave of absence from their medical training to complete the MPH, which is offered in an online format at some colleges. Many universities will accept two years of medical training for the two years of experience required for entrance into the MPH program. Personalize your studies with focus areas that match your interests and career goals with MPH@GW, the online Master of Public Health from the George Washington University. Choose from Health Communication, Health Policy, Program Planning and Evaluation, and Global Health. Attending an accredited school for your MPH can be just as important as earning the degree itself. Accredited programs are reviewed by experts in the field and ensure that the program is held to the highest standards possible so that graduates are prepared to work in that specialized field. Be sure to research whether your university and public health program are accredited by an accrediting body. MPH programs are accredited by the Council on Education for Public Health (CEPH). Accreditation is the process through which colleges and universities prove their worth as educational institutions. An accredited school is one that has voluntarily submitted itself to lengthy peer review processes, thus demonstrating a commitment to educational excellence. Choosing an accredited MPH program is important because it tells employers that you attended an institution which was reviewed officially by a third party and approved—it’s proof that your degree is legit. Accreditation typically comes in two forms: institutional and programmatic. Institutional accreditation—which happens both at the national level and regionally—is the vetting of a college or university’s entire catalog. Everything about the school is considered, including the quality of education offered and the effectiveness of the school’s administration and leadership. This type of accreditation is essential to the reputation of universities and the degrees they offer, but it does not speak directly to the quality the school’s individual programs. Programmatic accreditation—also called specialized or professional accreditation— is much more narrow. It focuses on specific programs, departments, or subsections of colleges and universities that already hold institutional accreditation. For example, entire institutions may be accredited by a regional accreditation agency, but specific programs such engineering or nursing or colleges such as a university’s School of Business may also be accredited by agencies specific to those fields of study. CEPH has two corporate partners—the American Public Health Association (APHA) and the Association of Schools and Programs of Public Health (ASPPH)—both of which support the Council’s efforts and echo its desire to further public health education. I’d like to earn a dual degree. Can I take all my classes online? Dual-degree programs often cross over from one specialized school to another at an accredited university. For example, students wanting to earn a master of public health and a Juris Doctor must take coursework at the college’s school of law, in addition to public health coursework. Some colleges do offer a dual degree options for the MPH online, but not all. Additionally, some dual degrees are blended, where the MPH—or part of the degree—can be completed online, but coursework for the other degree must be completed on-campus. Check with your accredited university for specific details. Can I finish my online master’s degree in the same amount of time as a traditional degree? Online programs are often designed for the working professional, someone who can only attend school on a part-time basis. Because of this, some online programs are only offered as part-time, which means it may take longer to complete than a traditional degree. On the other hand, some online MPH programs offer a fast-track option, allowing students to shorten their time to degree completion. Check with a school or program advisor for specific details; some schools may have the schedule you’re looking for. Is an online master of public health reputable? Accredited MPH programs are highly reputable, whether they are online or traditional. Check with your university and program administrator to ensure that the school and program you’re interested in are accredited by an agency that is recognized by U.S. Department of Education and Council for Higher Education Accreditation. What types of jobs are available for graduates of an accredited online master of public health program? A wide variety of jobs are available for graduates with an online master of public health. Biostatistician, epidemiologist, environmental health specialist, public health lobbyist, and health policy manager are just a few of the jobs available in this growing field. Richard A. Herbert Memorial Scholarship – Graduate students are awarded this scholarship based on academic and/or research performance. Students are selected by the American Water Resources Association’s Student Activities Committee. Udall Scholarship – Students with an interest in environmental policy, engineering, science, education, health or other related fields are eligible for this scholarship. Albert W. Dent Graduate Student Scholarship – Minority students in their final year of full-time health care management study are eligible for this award. Foster G. McGaw Graduate Student Scholarship – Established in honor of Foster G. McGaw, the founder of the American Hospital Supply Corporation, this scholarship gives financial support to students in health care management graduate programs. Students must be in their final year of a graduate program. Preference is given to student associates of ACHE. Andrea M. Rossiter, FACMPE Scholarship – This scholarship is for students enrolled in an undergraduate or graduate program relevant to medical practice management. Harry J. Harwick Scholarship – Sponsored by the American College of Medical Practice Executives, students in a graduate program accredited by the Commission on Accreditation of Healthcare Management Education are eligible for this award. Association on American Indian Affairs – The AAIA offers Florence Young Memorial Scholarships to students pursuing a master’s degree in public health. Richard J. Stull Student Essay Competition in Healthcare Management – The Richard J. Stull Student Essay Competition was named in honor of its namesake, ACHE president from 1965-1978. It is designed for future leaders in health care management to describe important issues and developments in their profession.